The best Psych Terms app at your finger tips! This cool app is entirely FREE, so be sure to check it out! This app gives you a rich selection of 1000+ frequently used psychiatric and mental health terms, phrases and definitions that are concisely written for quick and easy review. This app is ideal for all medical and mental health professionals, psychiatric residents, medical students, psychology students, therapists, counselors, and of course curious lay people who just want to familiarize themselves with the language of mental health! - 1000+ terms & definitions! - Alphabetically organized for quick reference! - Fully browseable & searchable! - Tap on the term to learn the definition! 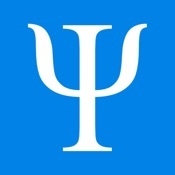 - Add psych terms to your favorites! - Share psych terms via email! - No internet or Wi-Fi connection required! "As a mental health counseling grad student, I think this free app is a handy guide to terms I see often and more importantly, many I don't see often enough to always remember the exact definition." "This is perfect. Might even be my favorite app! It gives great information!" "A very nice and useful app! Highly recommended!" "Perfect for my psychology class. This little app has helped me many times to pass a test."